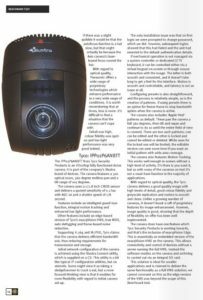 After completing its independent testing and field-based analysis, Benchmark Magazine has “Recommended” the Illustra Pro 30x PTZ. Against a field of similar PTZ cameras, the autonomous testers noted Illustra’s intelligent guard tour function, integral motion tracking, and enhanced low light performance during their real-world field trials. While Benchmark points out that “some installers and integrators still think that latency makes it difficult to track targets with the devices”, the Illustra Pro PTZ 30x dome has exceptional speed coupled with ultra-low latency. The camera tracks a scene with the precision you would expect from an analog PTZ camera. During their testing, Benchmark had some difficulty changing the default password during initial login. While we’ve been unable to replicate the issue in our labs and there have been no reports of this issue in the field, it further strengthens our belief that password changes should be forced by all manufacturers, something we practice and promote in our rigorous six-step Cyber Protection Program. Overall, Benchmark noted that the camera ‘delivers a good quality image with high levels of detail, good colour fidelity and greyscale replication and motion is smooth and clean’. Lastly, Benchmark points out an upcoming version of our cameras with an embedded exacqVision VMS, which we are pleased to report has already been released. To read more about the camera Benchmark reviewed, watch our video or visit our website. The new video intelligence analytics are now available on Illustra 2, 3 and 5 megapixel mini-dome IP cameras. These video analytics improve searching and reduce critical response time to key suspicious events with automatic detection of alarms. Illustra video intelligence analytics uses an algorithm to analyze surveillance video and provide advanced video analytics capabilities for object detection and tracking. 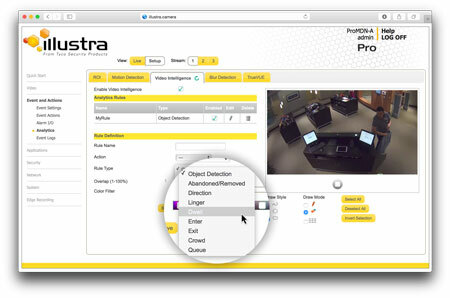 Learn more about Illustra video analytics.